Full-color table tent printing is used in many industries from restaurants to hotels. 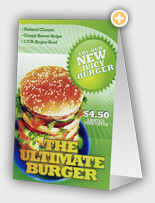 Anywhere people gather, table tents are a great way to advertise. Custom table tents aren’t for camping... but with these little guys camping out at all times, you can convey your message in a simple, straight-forward manner. Custom table tent printing gives you the flexibility you need to put your message right in front of your customers.